I stayed at Southmoreland on the Plaza as a part of a business group. Hosts/Owners Mark & Nancy were friendly, showed great care of their guests, and were very accommodating. I found the place charming, and the service excellent. The food was very good! A significant snow storm hit KC during our stay and they completely cleared my car of ice and snow. I would definitely recommend Southmoreland whether you live in KC or you are traveling to our area. Southmoreland on the Plaza is the best place we've ever stayed. The house is beautiful. The staff is wonderful. The owners are exceptional. We chose the William Rockhill Nelson room. The fireplace at the end of our bed was perfect. The bedding was super comfy. There was no disturbance in sleeping. Paper was at the door in the morning. We got to choose what time we wanted breakfast. The house is completely warm and inviting. Each room says come stay awhile with me. The breakfast was the best I've ever had. Thank you for a perfect weekend! 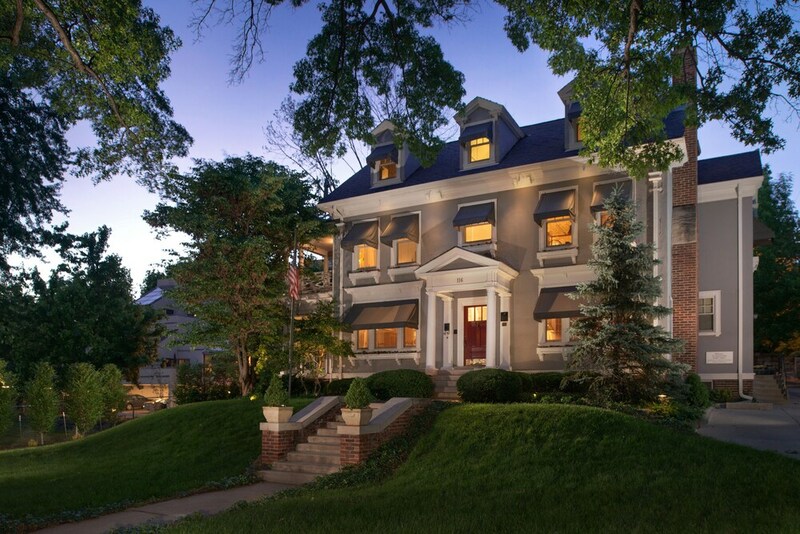 Southmoreland is just the perfect place to stay for your visit in KC. It's so close to so many attractions. Nancy and her staff are so incredibly pleasant. Coffee is always on, snacks in the evening before departing to a play or whatever you may be doing. Wonderful, incredibly tasty breakfast. The rooms are so quiet as well. It's just a wonderful place to lay your head. We came here when my husband and I were first dating and we so enjoyed our time here again for a couple days. We booked 3 months ahead of our family guest intended stay as a holiday gift for her. Booked airfare after. The week of the reservation after realizing we had not receiving a confirmation e mail or phone call called the hotel and they stated they spoke with a Sophia L**** (not us, no idea who that is) who had called and cancelled the reservation after receiving an erroneous e mail. The week we called to get some confirmation our room was not available anymore. Upgrading to a suite not attached to the hotel itself for the other party that was double booked in our room AFTER we reserved seemed like a fair solution. That room wouldn't have been appropriate for our visitor because it was detached and this was an older single guest. The most discouraging aspect was it took a good 15 minutes of persuading the manager to even get that request granted which was disappointing to say the least since they cancelled our reservation we made months before without notifying us. If someone calls to cancel a reservation that has a different but close name than the reservation and doesn't know any of the names affiliated. It isn't even her credit card on file for the reservation. Would not a manager take pause to call the phone number on the original reservation to make sure this was not a mistake AND at the least leave a voicemail if they did not speak to anyone on the listed reservation. I'm sure it is a fine hotel but if you do not receive a confirmation e mail of phone call do not expect to have a reservation. I believe both the hotel and we have learned a lesson. I hope they review how they manage cancelling a guests reservation if that phone call is made from someone not listed on the reservation. Call AND speak with someone on the original reservation. My wife and her sister planned this as a chance for us to get together for a fun weekend (they live in Omaha, NE and we live in Columbus, OH). We picked Kansas City since we would be passing thru there on our way to Denver and my sister-in-law recommended this place as a BnB that she had stayed at in the past. This is an urban BnB in the Plaza District of Kansas City. From the Inn, it is an easy walk to the Nelson-Atkins Art Museum and to the "downtown" or Plaza District. The Plaza district offers a wide variety of shopping and dining opportunities and you don't need your car. The rooms are all unique and I would urge you to check their website before selecting a room. Our rooms were both very comfortable and both had some balconies that would seat 4 (ours even had swing). The real treat, however, was their "BBQ breakfast" (Saturdays only and only during the summer and fall). Grilled pork chops with grilled French toast that was served with a bourbon, pecan dressing and croissants, juice, coffee, tea, etc. Sunday's breakfast was Huevos rancheros with some homemade bread plus the usual coffee, tea and juice. It was also an excellent breakfast but Saturday's was really special. They also have a "reception" from 4:30 to 6:00 with wine. One day it was cheese and crackers; the other it was a homemade Artichoke dip with crackers. The Artichoke dip was outstanding. Then - every evening - they have homemade cookies with coffee or tea. The public areas (an enclosed porch, a dining room, a living room, the breakfast room) provided nice areas to sit and socialize - not just with the four of us but with other guests as well. The owner was on-site (and cooked the Saturday breakfast). She and her staff were all exceptionally nice and very accommodating. Please note that they have a strict 4:30 check-in time but they'll allow you to hang out in the living room while they finish prepping the rooms - but there are no early check-ins. This little gem is not only beautifully designed and maintained both indoors and out, it is staffed by the kindest, most thoughtful hosts I've ever encountered. Ideally located between Kansas City's best museum and best shopping area, you could easily stay here without a car (but they do offer free, safe parking onsite.) Southmoreland serves elaborate, hearty breakfasts (fortunately half portions are available) and there is an afternoon happy hour with wine and snacks. Every room is different, and filled with whimsical touches and lots of reading material about the famous Kansas City personage that the room is named after. I cannot recommend Southmoreland highly enough for any one who's looking for a non-cookie-cutter hotel experience. My wife and I stayed two nights at the Southmoreland Urban Inn. The 1913 neo-Colonial style mansion is beautiful, and is located just 2 blocks from the famed Country Club Plaza with its fountains, boulevards, good restaurants, and upscale stores. We stayed in the Col. Robert Van Horn Room which is small but well appointed and comfortable. The common areas (living room, harvest dining room, solarium, and four season porch) are relaxing spaces to read, catch up on email, and enjoy looking out at the beautiful gardens around the house. The breakfasts were outstanding. Happy hour drinks and treats, late night snacks in the kitchen, and the apples and sherry in our room were very nice touches. The staff were all friendly and helpful. All in all, a wonderful experience. We just returned from KC where we were treated like royalty at Sothmoreland on the Plaza. Griiled breakfast on the patio was spectacular with grilled peaches topped with pecan bourbon maple syrup and a succulant pork chop! Ken and Nancy are gracious hosts and accomplished chefs! We could walk to the Nelson-Atkins Museum which was spectacular. As well, we strolled to the many fountains in Town which were so reminiscent of Rome! (Without the crowds)! We hated to leave! My wife and I have visited probably visited 20, or more B and B's in the past, both in Europe and here in the States. The Southmoreland is the "gold standard", in my view, of an inn and how the guests are to be treated. We loved the close proximity to the Nelson-Atkins museum and the Plaza. The afternoon wine/cheese at 4:30, the 8 PM fresh cookies, and the sherry in our room were all nice "touches". We were there for two breakfasts and both were outstanding. While the facility was very nice and well located, my wife and I both appreciated the owners and how welcome they made us feel. My wife and I stayed here just this week. Has to be one the most hospitable staffs I have ever encountered. They were personable, polite, and offered great assistance. The breakfast was amazing. Also, the cookies in the evening were tasty. Very relaxing environment and close to everything. Walked to Nelson-Atkins one morning from Southmoreland. Hope to return soon. Country Club Plaza is within a 5-minute walk of Southmoreland on the Plaza an Urban Inn while other popular sites like Nelson-Atkins Museum of Art are within a 15-minute stroll. This 3.5-star bed & breakfast has 13 guestrooms and offers conveniences like free breakfast, free in-room WiFi, and free self parking. Free full breakfast is served each morning from 6:30 AM to 9:30 AM. For a nice break, mingle with other guests at the free daily manager's reception. Guests can expect to find free WiFi. The bathroom offers hair dryers and designer toiletries. At Southmoreland on the Plaza an Urban Inn, guests have access to free WiFi in public areas. You can put free parking to good use if you drive. Staff members can help with accommodation requests, and provide concierge services. Free full breakfast is served daily from 6:30 AM to 9:30 AM. Guests can enjoy a free manager's reception daily. The preferred airport is Kansas City, MO (MCI-Kansas City Intl. ): 32-min drive, 26.7 mi/43 km.